At a boxing event in Atlantic City recently top boxing judge Steve Weisfeld asked “who beat four Olympic Gold Medalists?” About 15 minutes later he told me who it was. In the 1960 Olympic Boxing Trials Cassius Clay aka Muhammad Ali boxed in the heavyweight division and lost to Percy Price of the Marines. Ali was able to then drop down to Light Heavyweight and made the team and went onto win the Gold Medal in Rome, Italy. 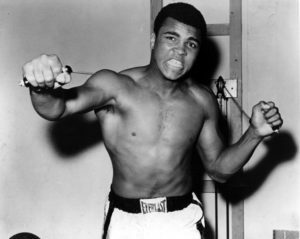 Upon turning professional he converted to Islam and changed his name to Muhammad Ali. During his career he would go onto defeat four Olympic Gold Medalists starting with 1952 winner Floyd Patterson, 43-4. Ali entered the ring at 21-0. It was November 22nd in 1965. Ali was making his second title defense at the Convention Center in Las Vegas, NV. Ali was well ahead when the contest was stopped in the 12th of a 15 round fight. Referee Harry Krause was one of the voting judges in addition to being the referee. He had it 53-46 while Harold Buck had it 54-45 and Bill Stremmell 53-43. On March 8th 1971 Ali in his third comeback fight took on the world champion who won Gold in 1964 “Smokin” Joe Frazier at Madison Square Garden in New York City. This writer had it 7-6-1 going into the 15th and final round when Frazier knocked Ali down to take the decision by scores of 8-6 in rounds from referee Arthur Mercante, 9-6 by Artie Aidala and 11-4 by Bill Recht. On March 20th 1972 Ali and Patterson had a return match with Ali stopping him in the 7th round on cuts for the North American Boxing Federation title at Madison Square Garden. At the time of stoppage referee and judge Arthur Mercante had it 6-1, Jack Gordon 4-2 and Tony Castellano 3-3. On January 28th of 1974 Ali had his second fight with Frazier, 30-1, for the NABF title at Madison Square Garden. Referee and judge Tony Perez had it 6-5, Tony Castellano 7-4 and Jack Gordon 8-4. On October 30th of 1974 Ali would regain the world title for a record third time defeating then champion “Big” George Foreman, 40-0 stopping him in the 8th round in what was called “the Rumble in the Jungle” in Zaire, Africa. Scores at the time of stoppage were 4-2-1 by referee and judge Zack Clayton, 3-0-4 Norridine Adalla and 4-1-2 by James Taylor. On October 1st 1975 Ali and Frazier, 32-2, would have their third fight called “the Thrilla in Manila” where Ali stopped Frazier at the end of the 14th round. On February 15th 1978 Ali lost his world title to 1976 Olympic Gold Medalists Leon Spinks, 6-0-1, at the Hilton Hotel in Las Vegas, NV. Lou Tabat had it 145-140, Harold Buck 144-141 for Spinks and Art Lurie 143-142 for Ali. On September 15th 1978 in their rematch Ali re-won the title at the Superdome in New Orleans, LA, before 63,350 in attendance. Lucien Lubert had it 10-4, Ernie Cojoe 10-4 and Herman Preis 11-4.